Interest in one-year, full-time MBA programmes for executives is surging in India. Those who enrol are typically mid- to senior-level executives, with an engineering background or some other degree, but usually no formal management qualification. Ghanshyam Tiwari, 34-year-old former Intel employee and graduate of the National Institute of Technology, Karnataka, enrolled in an executive general management programme at the Indian Institute of Management, Bangalore (IIM-B), in 2005. Intel, where he had worked for four years, paid the Rs 1-lakh fee for the six-month programme, and he attended classes on weekends. "I joined the IIM-B programme as a semiconductor engineer," says Tiwari. "I was able to conceptualise the complete business picture ... and not just focus on one function." Enthused by his broadened perspective, he enrolled in 2008 for a full-time MBA at the Kellogg School of Management in the US, and in 2011 went on to do a Masters in Public Administration, Leadership, Public Policy from Harvard University. He is now a country economist with the Bihar office of the International Growth Centre, a partnership venture between the London School of Economics and Political Science and Oxford University, and advisor to the Population Foundation of India in Patna. Tiwari's story reflects a growing trend. Interest in one-year, full-time MBA programmes for executives is surging in India. Such courses have gained momentum in the last five years. Those who enrol are typically mid- to senior-level executives, with an engineering background or some other degree, but usually no formal management qualification. These executives bring years of experience and knowledge to mid-career management courses, and share them with peers and professors. They enrol seeking to bridge the gap between their current and desired skills, so that they can play a larger role in management or shift their career path. The sectoral mix in such courses includes industries such as airlines and travel, business process outsourcing, defence, education, energy and power, financial services, government services, health care, hospitality, infrastructure, IT, management consulting, manufacturing engineering, manufacturing processes, media, non-government organisations, retail, shipping and telecom. The composition of that diversity is changing. Many students of the PGPMAX (Post Graduate Programme in Management for Executives) at the Indian School of Business (ISB) are from the IT and ITeS industries, but the proportion of those from other areas, such as automobile, energy, telecom, medicine, marine engineering, media and advertising, has risen from 11 per cent in 2012 to 23 per cent for the 2014 batch. Piyush Kumar Sinha, Professor of Retailing and Marketing at IIM Ahmedabad, says: "As students come from varied backgrounds and five to ten countries, it's a platform for us to learn from them as well." G. Shainesh, Chairperson of IIM Bangalore's executive MBA programme and professor of marketing, says his institute's 2012/13 batch had 74 professionals with average work experience of 9.5 years and average international experience of 2.7 years. The current class has 63 professionals. 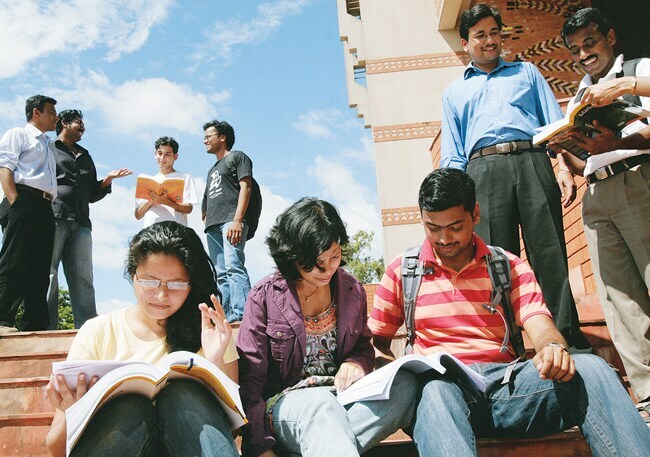 IIM Bangalore started its programme in April 2009. IIM Lucknow started its 27-month Working Managers Programme (WMP) in 2005, and one-year IPMX (International Programme in Management for Executives) in 2008. The Ahmedabad and Calcutta IIMs both launched their executive MBA programmes in 2006, and ISB started its PGPMAX course four years ago. Unlike courses abroad - especially in Europe - most mid-career MBAs in India require professionals to take a year's break from their career. ISB, which allows students of its PGPMAX to continue working, is among the few exceptions. Classes are held on ISB's Hyderabad and Mohali campuses for week-long stretches every six weeks. Seventy per cent of the students of this 15-month programme are from outside Hyderabad and Mohali. As part of the international immersion experience, they take a week of classes each at the Kellogg and Wharton schools in the US, and a week in Brazil. Enrollment numbers have shot up. IIM Ahmedabad's 2011/12 batch had 101 students - a 13 per cent increase over the previous year. At IIM Lucknow's Noida campus, the WMP started with 60 students, and the class size is now 120. Its IPMX course started in 2008 with 45 students and now has a batch of 70. IIM Calcutta's PGPEX is preparing for expansion. Course chairperson Runa Sarkar says: "We started with a student strength of 39 in 2006. It is currently 50, and we plan to increase it to 120 once the necessary infrastructure is ready." She explains that hostel accommodation is a bottleneck. "In a year or two, we should have doubled our intake, based on demand projections." IIM Bangalore and ISB are not expanding class size yet. ISB's batch size has remained at around 60 since the course began. 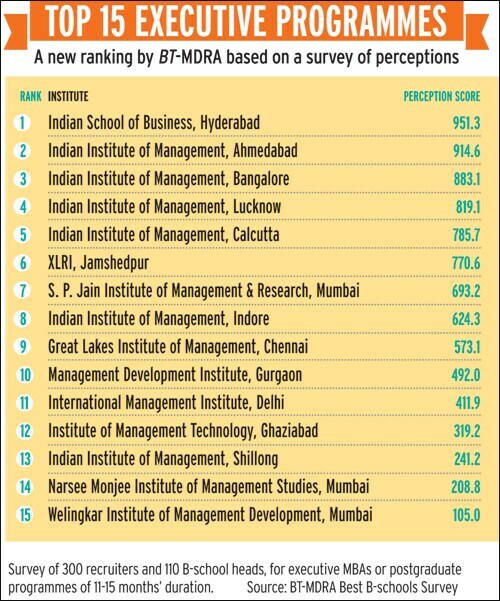 IIM Bangalore's Shainesh says that his institute's executive MBA course is popular with degree-seekers and recruiters. "But we won't increase our batch size now. We want to make sure students get good training, as they have to take a year's break from work." Time was when an MBA was a must for a senior management role. Today, an executive MBA is a must. Uday Damodaran, Professor of Finance at XLRI, Jamshedpur, says: "These executives start working at an early age, but later realise the missing link of an MBA, when changing their domain or type of employer, say, from a public-sector company to the private sector." Sinha of IIM Ahmedabad says: "These are specialists in their respective domains, who develop a more generalist approach after a one-year MBA like ours. Most of them change their domain after an executive MBA." XLRI's Damodaran says applicants calculate return on investment (RoI) when deciding to do an executive MBA. "Mostly, they go back to the industry as CTO, COO, director, head of IT, vice president and so on." When weighing the benefits and costs of such a course, and the loss of income for its duration, students' calculations need to be watertight, especially if they have a family to support. Typically, those who do MBAs after years of working seek to recover their cost in less than three years. Devendra Dwarkanath Kale, 29, joined IIM Ahmedabad's PGPX programme in 2011 and graduated in March 2012. He compared the average post-MBA salary for the past two years, with his own pre-MBA remuneration in cost-to-company (CTC) terms, and then considered his own investment. "I didn't want the payback period to exceed three years," says Kale. "The programme also helped me penetrate the consulting industry, which I was eagerly looking to do. Package-wise, I saw close to a 100 per cent increase in CTC." Recruiters are enthusiastic about executive MBAs. IIM Lucknow (Noida campus) professor Rajeev Kumra, who is Chairperson of the WMP and Co-chairman for placements, says: "The IPMX programme has seen a bigger jump in placements in the last two years than other IIMs. 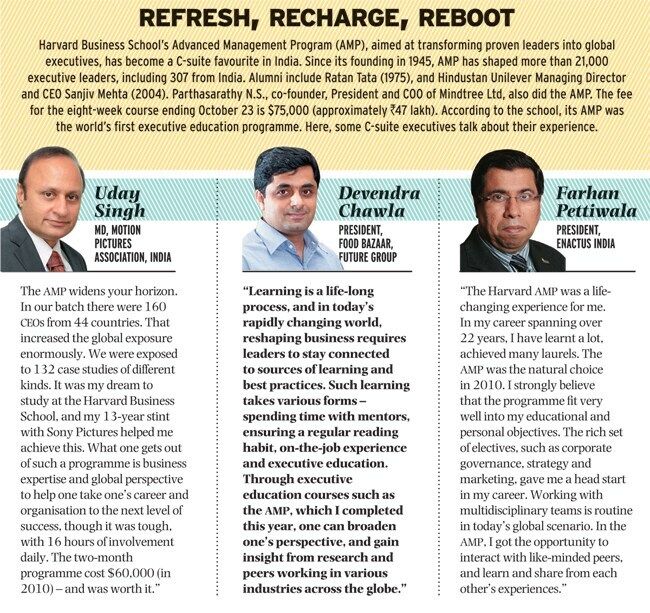 The Indian market is responding to one-year executive MBAs as these professionals deliver from the first day." XLRI's Damodaran says things are still cooking. "The output has gone up, certainly, but the one-year MBA is still at an early stage," he says. "It's not as popular in India as in Europe. Once the economy improves, there will be growth." Deepak Chandra, Deputy Dean at ISB, Hyderabad, says: "India's growth was creating demand for business leadership when there were few MBAs a decade ago. Participants put in their own investment, and at times they let go of a sponsorship as they wanted to keep their options open at the end of the course." He adds that many come to the course from senior roles in their domain of expertise. Unlike the IIMs, ISB does not offer placement services for executive MBAs. One reason is that many participants' employers grant them time off from work so they can attend the programme. So offering placement would amount to disregard for the employer's support. Another reason is that campus placements are usually not appropriate for senior-level participants. Most mid-career MBA graduates are sought out by employers or further their careers through their networks. Many Indians are opting for executive MBAs from B-schools in other countries, such as INSEAD in France and Queen's School of Business in Canada's Ontario province. INSEAD offers a Global Executive MBA and the Tsinghua-INSEAD executive MBA. The programme takes place on three campuses in Europe, Asia and West Asia. "We have 25 students from India in our current programme consisting of 185 students," says Kristen Lynas, Director of INSEAD Executive Degree Programmes. The executive MBA has 19 per cent women participants and 55 nationalities. The average age is 37, and average experience, 12 years. Since 2003, when INSEAD started its global executive MBA programme, it has had 71 students from India. 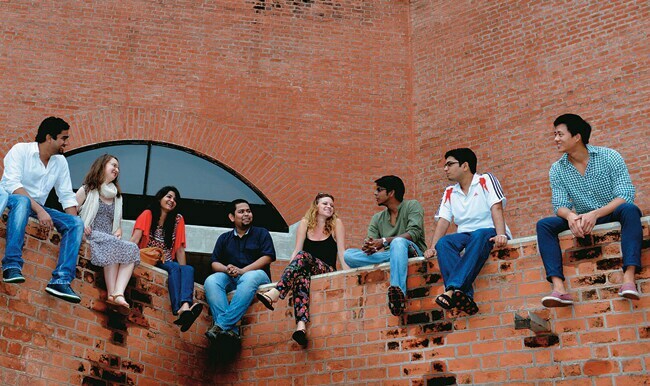 Many Indian applicants favour international MBAs. One of them is 30-year-old Rahul H. Saxena, whose three years of experience in IT were not enough for a one-year executive MBA in India (they usually require seven or more years of work). He wanted to study at a global institution. He reckoned that chances of studying in the US were low, and the recession would make it hard to gain work experience there. "I got a scholarship for 40 per cent of the course fee," says Saxena, who went to Queen's School of Business. "For the rest, I took an education loan." He says the course taught him the nuances of team-building the hard way. "The stress hones you for the better." It doesn't hurt financially, either, in the long run. Before his executive MBA, he made Rs 8 lakh a year at his IT job. Now, as a management consultant with EY India, he makes Rs 18 lakh. For some, such as 32-year-old Nitin Kumar, cost is not a major concern. He was a project leader with an IT company in the US for nine years. He decided to pursue a full-time executive MBA because he had reached as high as he could go in his role. In November 2012, he quit his $69,000-a-year (then around Rs 38 lakh) job and is now enrolled in IIM Calcutta's one-year programme for executives, where the fee is Rs 18 lakh. He is optimistic about returning to IT in a senior management position. "It's more like a two-year MBA, as one has to clear six terms in a year," he says. "It's worth it."